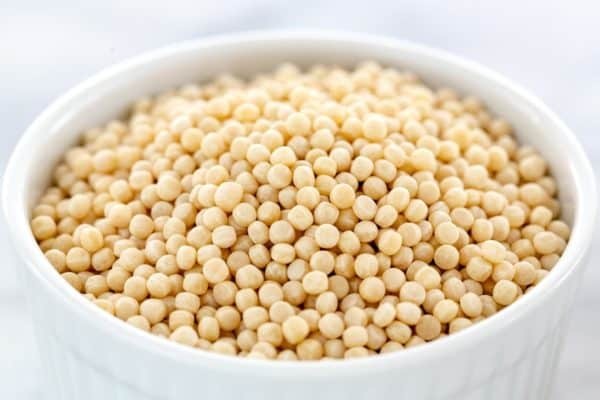 Couscous is crushed durum wheat semolina formed into small granules or spheres. It’s commonly served in North African, Moroccan, Tunisian, and Algerian cuisine. 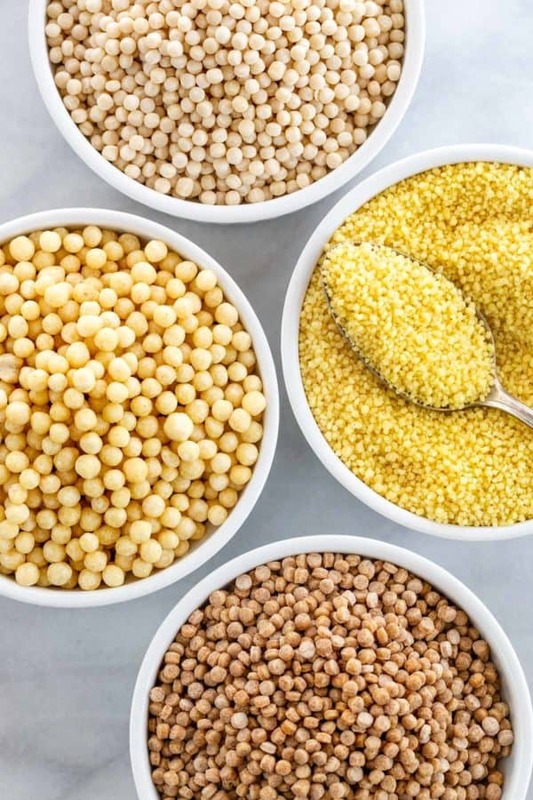 The less refined grain is sold in different varieties of couscous with interesting nutritional perks. 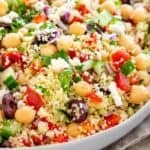 Couscous is a convenient product to have stocked in the pantry as an easy and fast alternative to rice, quinoa, and noodles. When cooked they look like golden spheres that have a pleasant nutty flavor. The texture can range from slightly coarse yet tender for smaller types, or chewy for larger varieties. The neutral taste allows it to be kept as a simple side to serve with stews and braises. 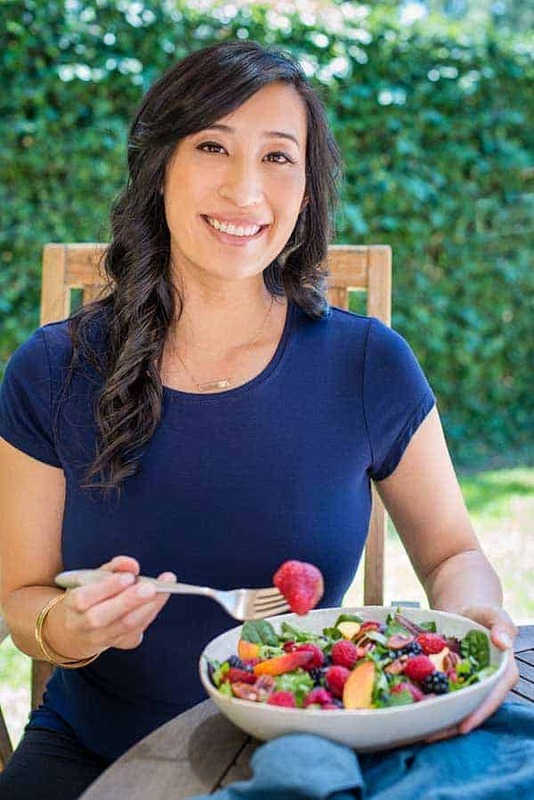 It can be transformed into more interesting recipes like hearty fresh salads or infused with broths, stocks, meats, vegetables, and spices for a satisfying meal. The smallest size, and most often found in grocery stores. It also comes in whole wheat versions. The instant typed cooks up fast because it’s been pre-cooked by steaming and then dried. That leaves the cook with the simple taste of rehydrating in hot water. Instant is either labeled on the package or check in the instructions if the soaking is less than 10 minutes, typically 5 minutes. Otherwise, use the traditional method of steaming in a tagine or steamer basket. Is a noticeably larger size, similar to peppercorn, and is also sold in whole wheat varieties. The increased size compared to Moroccan couscous requires a little longer to cook. It’s simmered on the stovetop and then briefly covered until tender. It has more of a pasta-like taste and texture with some springiness. Companies offer whole wheat versions of Moroccan or Israeli pearl couscous. This gives an extra boost of fiber, protein, and micronutrients like iron, manganese, and magnesium. It’s cooked similar to regular couscous, however, confirm with the package instructions. Lebanese couscous also called Moghrabieh, the name of the finished traditional Lebanese dish. It’s sold fresh or dried and is the largest in size, similar to a pea. It’s often boiled, drained and then mixed with oils and spices, or added to meats as a tasty starch in hearty stews and braises. 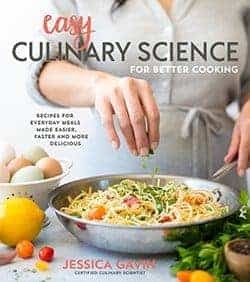 Is couscous good for your health? It’s a great vegetarian or vegan grain option, but not gluten-free. It’s low in fat and delivers proteins and some minerals. Select whole wheat flour to slightly up the dietary fiber and protein content. The variety will determine how to cook couscous. Instant Moroccan can be prepared in under 10 minutes on the stovetop or microwave, making it the quickest to prepare. It’s eaten plain as a side dish, combined with spices, nuts, and dried fruit, or tossed into a fresh salad. The larger size of the Israeli and Lebanese products requires simmering on the stovetop with more water to help hydrate the grains. These are often added to soups, stews, and sauces to add a carbohydrate element to the dish.